iVI 4.620 – Easily convert and import video files into iTunes or iMovie. 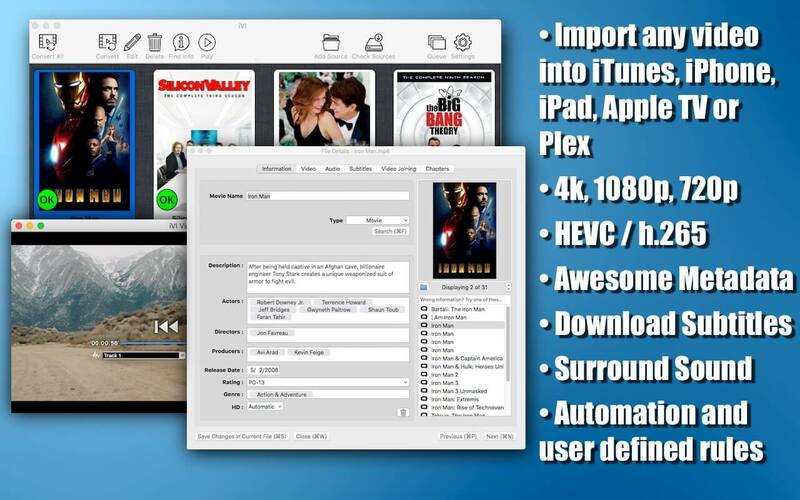 iVI is a video converter that can import files into iTunes or iMovie with a simple drag and drop. iVI will also add metadata if movies or TV shows are identified. iVI will convert multiple audio channels in the file including various languages and surround sound and these are accessible from Quicktime, Apple TV, iPhone, etc. iVI supports both VobSub and plain text subtitles from the source file and these are accessible from Quicktime, Apple TV, iPhone etc. Next story TotalSpaces 2.7.6 – Brings back grid-style Spaces and more. Previous story Grids 5.1 – A beautiful way to experience Instagram. Permute 2.5.9 – Easy-to-use, drag-and-drop video conversion. Video Plus 1.1 – Powerful Movie Editor.